The weather cools. Change looms. For me, fall has always been a time of renewal–like my own personal new year. The air feels fresh. Summer’s humidity fades into cobalt blue skies punctuated with layers of bright-white clouds. While this season of newness inspires my senses (particularly my culinary senses), it also quietly heralds a melancholy I can’t quite explain. I think I miss the constant activity of summer, but then realize the shorter daylight hours of winter’s approach are only giving me a bit more time to ponder. More time to think about the important things in life, like relationships and balance. I begin to miss the ease and depth of friendships with friends far away (and the summer memories we made). I regret the bigness of the world. I wish my own world would shrink and loved ones would be close enough to sit with me, enjoying the autumn air, even for just a moment. So what’s an introspective, fall-loving, melancholy life-ponderer to do? What anyone would do, really. I buy some good red wine, a fifth of brandy and combine it with a few cinnamon sticks and local honeycrisp apples. The world dwindles, slows. It becomes as small as a glass, the deck, a voice on the line, and the refreshingly cool, ever-changing fall breeze blowing through crepe myrtle trees. In a large pitcher, combine the apples with the nutmeg and black pepper. Pour the red wine, cider, and brandy over the apples. Cut the orange in half–slice one half and squeeze the juice of the other half into the red wine mixture. Add the cinnamon sticks and orange slices to the pitcher. Let sit in the fridge for at least an hour. I sampled this after about 30 minutes and it was delicious, but tasted much more like fall after a few hours. The next day it was autumnal perfection–a seasonal cocktail to share with your closest friend. Who knew that those were the days? Oh, Peggles (may I call you Peggles? ), you just made me snort spare ribs out of my nose while I was cursing at this fitted sheet I’m trying to fit into the linen closet. Aren’t honeycrisp apples the best? It’s really kind of embarrassing how amped up I get when they finally start showing up in my market in late September. I can’t wait to try out this drink this weekend — I never would have thought to add black pepper! There’s a Spanish restaurant in Philly that has the BEST sangria. That’s where I got the idea for black pepper. Their sangria is so spicy I thought it must be black pepper. Maybe next time I’ll try a few peppercorns, but I didn’t want to over power it. Ahhh….your words were comforting, I feel relaxed now. Time for sangria! This is my favorite season by far. I bought some mac’s last week and have had an apple with every meal and in between snacks. An apple a day keeps the doldrums away…. I’ve been eating apples everyday too! Honeycrisp for now, because they are in season, but will soon be gone! It was heavenly, Darya. And best of all — not too sweet with the perfect blend of spices. Well if that isn’t just the loveliest introduction brandy has ever gotten! I feel exactly the same way about the fall. In fact, let’s just say I said this, especially when you see those first few paragraphs show up on my blog tomorrow. Isn’t plagerism the sincerest form of flattery? Heat that up and you’ve got a winter gløg, Scando-style! I thought about heating it up! Next time…when the weather gets colder. I try to find excuses to use it whenever I can. It’s hard in the summer. I’m also a ponderer! Yay us! I’m pondering right now why Honeycrisp apples are so damn expensive! Last year was a bad year for them or something at the orchard where we go sometimes to pretend we’re migrant workers for a day. Honeycrisps are a short season–you better strap the kids to your back and take to the fields. And yes, yay us. Pondering is mostly a bad habit. My brother-in-law is an apple farmer in Michigan. They got nailed last year with late frost- no harvest. They got nailed this year with perfect growing conditions – so many apples they don’t know what to do with them, can’t find pickers and the price on most varieties will go down, down, down. Farming really is feast or famine, isn’t it? Farming must be so difficult! And alarmingly insecure. Tell your brother to call Don and his minions to help. Then Don can add “apple picker” to his many trades. Oh, HELLO. YUM! And, what a coincidence, I’m taking the family to “Apple Hill” this weekend. Honey crisps–here I come! Aren’t those the best apples ever???? Recipe bookmarked. They ARE the best apples ever–they even stay crisp after floating in wine and brandy for 24 hours. Let me know if you really do make this! I loved it so so much. Follow-up. No Honey Crisps in all of Apple Hill. WTH?? I have a mission now — just so I can try this recipe. Sometimes honeycrisps are hard to find! Use any firm (not mealy) apple. Not quite ripe pears would work too! Love this post and this drink! Cheers! What lovely pictures and even more lovely thoughts – “the world dwindles, slows.” I’m going to make this tomorrow! And if you want things to REALLY slow down, drink the whole pitcher. Rache, I had to come back, like the leper who was healed, to say I actually DID make this last weekend. My 24-year-old daughter and I really enjoyed it, but I put in too many apples so the experience turned into bobbing for apples more than drinking. I was surprised between the two of us we didn’t finish it all up. Ha! I love your leper who was healed reference. It makes quite a big pitcher -probably enough for four or two, if you’re me. Do you think the recipe calls for two many apples? Or do you just need bigger glasses? 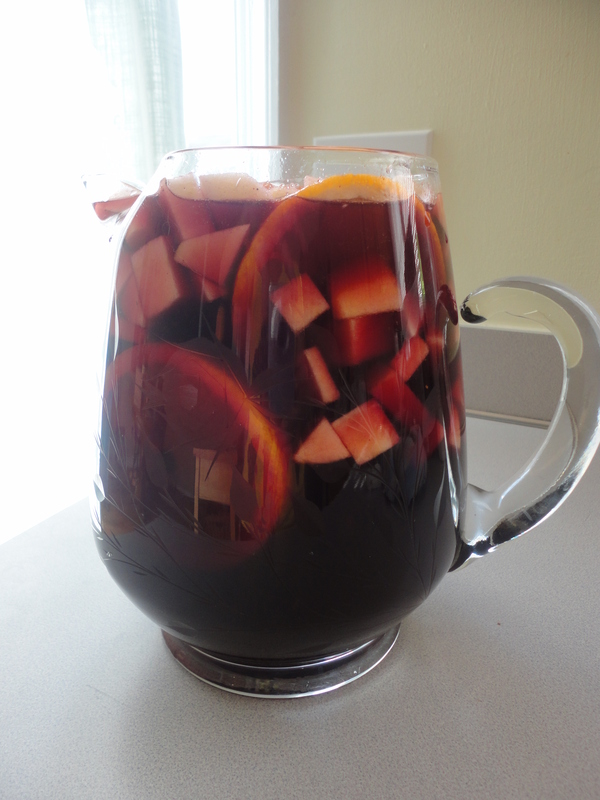 Sangria is my all-time favorite! I am known as the Sangria girl, by many. I can’t wait to try this fall recipe! Thanks! Nothing better than wine and seasonal fruit! Enjoy! It really is the perfect autumn sangria. Oh Daile, I love your new gravatar – so pretty. And yes, make this with red wine but use pears or strawberries instead. Cheers! Ooooh, pumpkin liqueur sounds like a nice addition! I’m SO glad you like it!!!!! I’m making it again this weekend for company. I’m so glad you liked it! I’ve made it twice since this post. I can’t wait to try it heated up once the weather gets cooler. Oh my. This hits a yummy nerve. My husband and I have just discovered spiking our favorite red wine with homemade apple juice. It’s kinda like sangria, I suppose. Really good! Your recipe looks zingier. 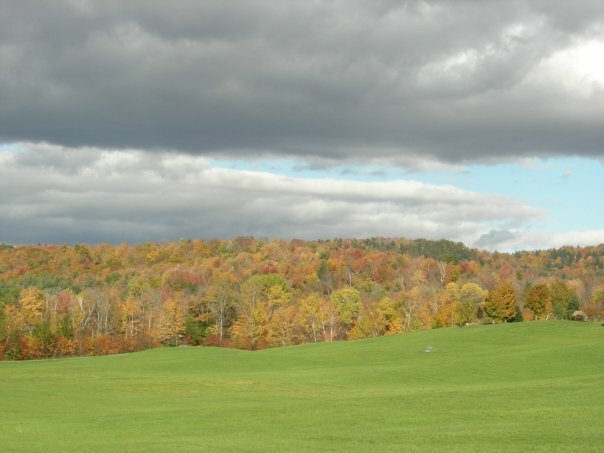 Vermont tugs at my heart strings every October. And yes, this recipe is delish. I’ve made it without the brandy as well. It’s just as good (not as zingy). Hey, Rachel! Missing your fall photos. You are probably enjoying India right now, don’t forget about us when posting of your travels. We home types like to live vicariously through others. Hoping you’re well. Cheers! Hi Tina! I’ve made this without brandy–it’s still good! Happy Thanksgiving!